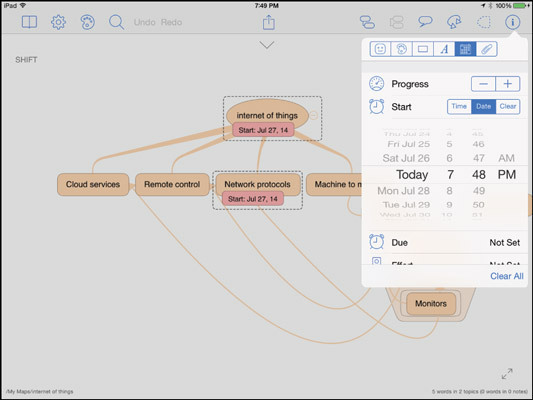 If you want to get fancy with your work mind maps on the iPad, you can in iThoughts HD, such as to create stunning mind maps that you might present in a meeting. Research: Opens a Search page showing the results for whatever term is in that node. When in that search mode, you can change the search service using the compass icon in the upper right of the screen, such as to WolframAlpha or Google Scholar. Make Topic(s): Makes a child node for each selected word (each word becomes the label for the new corresponding node). Add to Note: Adds the selected text to a note attached to that node. You see a little note icon in the node indicating that you have a note there. Tap it to have the note appear above the mind map in a drawer that opens. A note is not a comment; a comment appears on the mind map as a type of node, whereas a note is inside the node. Open selection menu (­): Opens the standard iOS contextual menu for text selections. Move Left a Word (|Word) and Move Right a Word (Word|): Navigates your text cursor through the currently selected text. Move Left (the left triangle) and Move Right (the right triangle button): Moves one character left or right, respectively. Open Text Style Pop-over (A): Lets you adjust the text size, font, color, formatting, and alignment of the selected nodes’ text. You can change how your mind maps are displayed using the Settings button (the gear icon). It lets you change the canvas color, font, style of the link lines, and the map layout. For the map layout, the default style is horizontal, which adds new nodes to the left or right. But you can switch to Vertical, which adds them below and above; Top Down, which has them flow down from the top; and Fishbone, which has them flow to the right from the root node. You can also enable Rainbow Colors, which applies different colors to nodes based on their relationships. Changing these settings changes the layout of your current map. If you tap an object, the standard iOS contextual menu appears with the Cut, Copy, Paste, and Delete buttons. Plus the Research button is also available for text selections. To select multiple nodes, tap and hold the Shift button with one finger and then tap each node with another finger. Release both fingers when you’re done selecting. Icons: Inserts icons to the selected nodes. Tap and hold an icon and then tap Add to Favorites to add it to the ­pop‐]over’s Favorites list. Palette: Applies a color from the swatches that display, or you can choose a specific color by tapping More to show the color picker. Shape: Lets you choose the shape for the selected objects. Project Settings: This pane lets you set indicators such as degree of progress, start and due dates, estimated time frame for the research or delivery effort, and resources (a list you create of resources needed for the selected nodes). This pane’s capabilities transform iThoughts HD from just a mind-mapping tool to a project-estimation tool. Related Items: Lets you associate a library image (iThoughts HD–­provided artwork to help decorate nodes), a photo from the Photos app, a photo you take with the iPad’s camera, a doodle, a link to another mind map, or an email address. This pane’s options are available only if a single node is selected. Cloud: Lets you share the mind map with others via the Dropbox cloud storage service (if you have a Dropbox account, of course). Image: Exports an image of your mind map that can then be sent to other people or apps, as well as printed, via the standard iOS Share sheet.